Oleg Aliev the creative nickname is «Oley Elate". He was born in Novopolotsk, Belarusia. 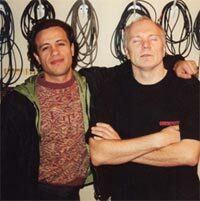 In 1981 he worked with rock-bands as a light and sound director. He released some sole records. Since 1988 he head been working with the bands from Moscow. The studio Melody was a shelter for some years he was a sound director. In 1991 he moved to Saint-Petersburg . two years working at Len film allowed him to broad his skills. He could record the nature sound, electronic music so the work in a traditional style was put away for many years. By 2005 he organized his own studio and continued the collaboration with many bands from saint –Petersburg and he visited The Melody studio in Moscow to master his skills. Nowadays a new record of sole classical music has been released. He continues the work with rock-n-roll bands from Saint- Petersburg. Oley Elate is getting ready some sole records in different musical styles.